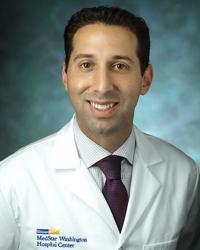 Jonathan Grinstein, MD, is an advanced heart failure physician at the Advanced Heart Failure Center at MedStar Washington Hospital Center. He is an Assistant Professor of Medicine at Georgetown University School of Medicine and a member of the Alpha Omega Alpha Medical Society and the Gold Humanism Honor Society. As a specialist in the field of cardiovascular disease and advanced heart failure, Dr. Grinstein treats patients through the use of left ventricular assist devices (LVADs), long-term IV medications or continuous infusion pump medications, and heart transplantation. Dr. Grinstein received his medical degree from the University of Chicago. He then joined Brigham and Women’s Hospital, associated with Harvard Medical School, for internship and residency training in internal medicine. Finally, he returned to the University of Chicago for a three-year fellowship in cardiology followed by specialty training in advanced heart failure. Dr. Grinstein participates in novel research involving LVADs. In lieu of a physical examination or an invasive right heart catheterization procedure, Dr. Grinstein has researched, perfected, and currently utilizes an echocardiographic and computed tomography techniques to noninvasively monitor the pressure, volume and flow inside the heart of individuals with an implanted LVAD. This technique allows cardiologists to analyze how well a patient is responding to the device and make necessary adjustments in real time. He has also conducted research to develop a “smart” LVAD that can intuitively adjust its speed based on the physiological needs of the patient. Dr. Grinstein is passionate about continuing groundbreaking research at MedStar Washington Hospital Center’s Heart and Vascular Institute. “Every patient, no matter how sick, deserves the opportunity to improve his/her quality of life and to extend his/her life with advanced medical techniques. I went into the cardiovascular field, and more specifically I was drawn to advanced heart failure, because I want to help people at their time of most need. “I’m truly a believer in research. I’m constantly trying to evolve my philosophy and practice to incorporate newer state-of-the-art techniques that significantly improve patient outcomes.